The Costa Blanca enjoys warmth, sunshine and a remarkably low rain fall with an average of 300 days sunshine each year. This results in a unique climate identifying our area as the heart of the healthiest region in Europe. Its reputation as a mecca of health comes from the World Health Organization description: “An environment almost as perfect as it is possible to obtain”. Moraira is an exclusive Spanish coastal village which remains one of the most unspoiled tourist destinations on the Mediterranean Costa Blanca strip with 8 km of coastline backed by mountains and vineyards. Moraira’s historic roots as a fishing village are still in evidence, its fish market is one of the most popular on the Costa Blanca region and the port still has fishing boats in operation today. The Moraira region is also famous for the growing of grapes for wine making. 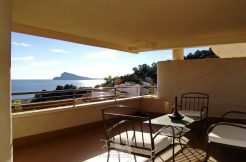 Moraira focuses today on tourism and Spanish property sales that have transformed the coastline over the past 30 years. To preserve the heritage of the area the council passed controls to protect the native trees and limited the height of buildings. Planning regulations have prevented over development making it a highly desirable destination. Moraira has several sandy beaches popular with families, many rocky coves and inlets frequented by snorkelers and scuba divers. Moraira is also seen as a culinary destination with many bars and traditional restaurants. For golfing fanatics Moraira offers several golf courses within a short drive and Jávea Golf Club is just 10 minutes’ drive. Moraira Marina (Club Naútico) is a safe haven with 24 hour security which offers permanent berths, repairs and maintenance and lifting and slipping facilities. Also in summer they have sailing courses and regattas. The district championship for open sea yachts is held on Easter and the Regatta “Moraira-Santa Eulalia” takes place at the end of September. If you are looking to buy your ideal dream home and enjoy a lifestyle in the sun in this fantastic Costa Blanca area please contact Martin & Price, we will help you find the perfect home to meet your individual requirements.